Bertrucat d’Albret held a high- even preeminent- position among the routier leaders whose companies spread terror and disruption across France and beyond in the years following the Treaty of Brétigny. Despite regular appearances in the pages of Froissart, however, he lacks the name recognition which the chronicler gave to lesser figures like the Bascot de Mauléon or Merigot Marchès. Nicholas Savy has now set about reconstructing his career and setting him in his proper context. In many ways Bertrucat exemplified remarkable upward social mobility achieved through the effective use of violence and the threat of violence. Born around 1335 as an illegitimate member of a cadet line of the great Gascon Albret family (usually known as “Labret” in his own day), he died in 1383 as the master of a complex composite lordship which dominated wide stretches of south western France and included lands as far away as Navarre. This was based in part on conventional forms of property ownership and wardships but also involved a package of what might best be described as protection deals with the region’s major towns. Crucially, the English administration in Bordeaux chose to recognise him as the overarching commander of the various routier companies operating across the region which claimed an “English” allegiance, thereby legitimising his (and their) position and financial exactions. How did he manage to come so far? Savy’s minutely detailed study of the ups and downs of his career gives some clues. 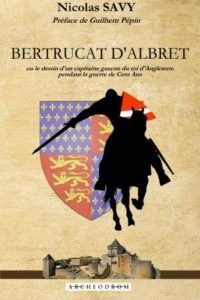 Bertrucat’s consistent English alignment obviously worked to his advantage in dealing with the local administration in Gascony and, beyond that, the royal government in London (Bertrucat spent much of the last two years of his life shuttling between London and Gascony and may have died from an infection picked up on his travels). He had plenty of friends and associates among the English military classes, especially men like Robert Knolles who had shared the life of a routier captain, while the very limited financial resources available to the Anglo-Gascon administration obliged it to wage war on the cheap by legitimising the activities of men like Bertrucat. His family origins helped as well. By the time of his death he was the last member of the Albret clan openly aligned with the English, but he still benefited from the solidarity of relatives on the other side; at one key moment family links saved him from years in a dungeon or even execution at the hands of Louis of Anjou, the chief French commander in the region. As this suggests, life was not always straightforward for Bertrucat. He was captured on at least six separate occasions (the final one within the last year or so of his life) and presumably had to pay substantial ransoms (though the details of these transactions are not always clear). He had the problems over obtaining payment of his wages familiar to all soldiers of the time. It was not always obvious that the smaller scale routier commanders over whom he was assumed to exercise authority saw the relationship in that light. He spent much of his life on the road, fighting in Spain and in Normandy as well as in his native region. He cannot have spent much time with the wife he married when he was already in his mid thirties- nor indeed with the mother of his only son, a shadowy figure who probably died young. Savy’s account throws a wider light on the mental world of the routiers. Through Bertrucat and his associates he illustrates the rather strange compound of legalism, chivalric language and latent violence which defined their activities. Despite operating on the edge of settled society, they were always concerned to have at least a shadow of legal authority for their activities and surprisingly willing to go to law to enforce agreements originally entered into at sword point. What in practice amounted to protection rackets were clothed in the language of feudal obligation and patronage. Savy is perhaps a shade inclined to take Betrucat and his peers at their own estimation and at times slightly underplays the threat (and reality) of violence which always underpinned their dealings with regional estates and urban governments, though it is clear that Bertrucat was prepared, at least up to a point, to take action when routiers breached his agreements with urban authorities. Chivalric language aside, it was obviously in his interest to be responsive to complaints of that nature- Don Vito Corleone and Tony Soprano would have understood his position perfectly. It does however add an important dimension to the rather simplistic image of the routier which emerges from Froissart’s oft-quoted “interview” with the Bascot de Mauléon at the Hostelry of the Moon in Orthez and has all too often been taken as definitive. There are some obvious gaps in Savy’s account, mostly derived from source limitations. It is hard to get any real sense of Bertrucat as an individual or of how he saw the world and his role in it. While it is possible to guess at his motivations and why he made the choices he did (it is highly plausible to argue that he felt a sense of loyalty to the Albret clan, for instance), there is no way of being certain. He must have been a competent soldier and an effective leader to have achieved what he did but he remains an elusive subject despite Savy’s best efforts. Nor is there much evidence about his immediate associates; there only seems to be one surviving muster roll of a company under his command (drawn up when he was fighting for Charles of Navarre in 1378). This was long on men rather like himself, illegitimate sons of Gascon noble families, with a sprinkling of (presumably) hardened professionals from across southern France and even beyond. The recruitment and internal dynamics of his following, however, remains rather shadowy. Savy’s account is very much rooted in Bertrucat’s native soil in south western France and his touch is sometimes less secure outside that region. His account of the Great Revolt of 1381 (when Bertrucat, who happened to be in London at the time, was probably part of the royal entourage at Smithfield), for instance, is based on rather dated interpretations and he seems uncertain over the independent status of the Scottish kingdom- perhaps a case of seeing the world a little too much through the eyes of his subject. One must however salute the sheer amount of work which Savy has undertaken to assemble a coherent account of Bertrucat’s life and career- the bibliography lists no less than twenty two archives in four countries. He has managed to bring a man who was a major player in the warfare and politics of south western France during the chaotic years after 1360 back into historical focus while also enriching our understanding of routier operations and mentalities. It is a major achievement.